Design: A scarlet flag with a gold illustration of the U.S. Marine Corps emblem (which consists of a globe, and eagle, and an anchor) and the text "Semper Fidelis" (the Marine Corps motto) and "United States Marine Corps". 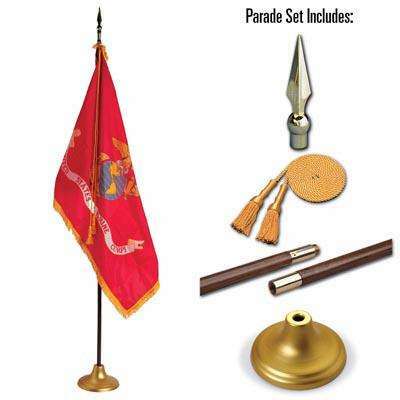 Use Today: The Marine Corps Flag is flown at ceremonies and in the offices of the President of the United States, Secretary of Defense, Secretary of the Navy, and the Chairman and Vice Chairman of the Joint Chiefs of Staff to honor past and present members of the Marine Corps. Not much is known about the flags flown by the first U.S. Marines, although some believe that the Grand Union flag was used by early American Marines in the late 18th century. In the 19th century, the Marines carried a standard that consisted of a white field with gold fringe, an illustration of an anchor and an eagle in the center, and the phrase "From Tripoli to the Halls of the Montezumas". During the Civil War, U.S. Marines carried a flag of red and white stripes, with an eagle perched atop a shield of the United States, a half-wreath beneath the shield, and 29 stars encircling the design. In 1914, the Marines began to carry a new blue flag that featured the Marine Corps emblem of an eagle, a globe, and an anchor. The flag also displayed the text "Semper Fidelis", which is the Marine Corps motto and is Latin for "Always Faithful." 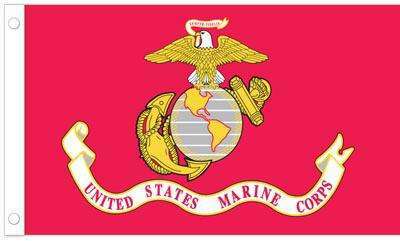 On April 18th, 1925, scarlet and gold were designated as the official colors of the U.S. Marine Corps, but it was not until 1939 that a flag incorporating the new colors was adopted by the U.S. Marine Corps. 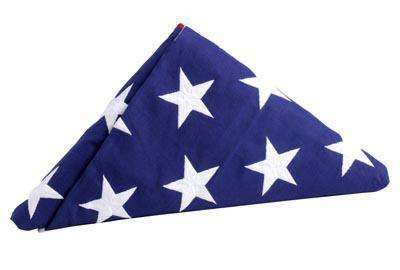 This flag is the same flag that the U.S. Marine Corps uses today, and includes an illustration of the Marine Corps emblem and a small banner held in the eagle's beak that says "Semper Fidelis". The current emblem of the U.S. Marine Corps consists of a globe displaying the Western Hemisphere, an eagle with spread wings, and an anchor. These three items symbolize battle on the land, in the air, and in the sea. The anchor and eagle symbols can be traced back to early ornaments of the Continental Marines, and the symbol of the globe traces back to the British Royal Marines. The eagle and globe also signify service all over the world, as the eagle depicted is a crested eagle which can be found all over the globe. The first official emblem of the U.S. Marine Corps was approved in 1868, and it included the globe, eagle, and anchor along with a ribbon reading the Marine Corps motto "Semper Fidelis". This emblem can be found on Marine Corps flags, uniforms, etc.